Every home needs a mudroom. With the inclement winter weather, coats, gloves and muddy boots will be the apparel of the season. Remember how this apparel has a tendency to track remnants of the outdoors into the rest of your home. That is where your mudroom makes this transition simple. The tips that follow should help your family get in and out the door with ease. They will help you improve your home’s organization even if you only have a small space to work with. The design and function of your mudroom depends on the layout of your home. The mudroom is the place which serves as the midway point between the outside world and the clean interior of your home. The mudroom is strategically located – usually off of the kitchen or garage and is easily accessed via the most-used entryway into the house. In some homes, the bottom of a stairwell leading to the kitchen/living space, can be the right spot. The thing about mudrooms is they really are an anything-you-make-it feature. Adding one of these in your home is the ultimate display of design creativity because you aren’t that limited in terms of functional expectations. Do you live in a cold climate where you need a lot of outerwear within arm’s reach? Would you like to take care of dirty clothing without having to drag the mess into the rest of the house? Are you simply looking for an organizational system to keep all your essential items ready for when you head out the door? Whatever your personal needs may be, make sure to list them out so you have them on hand as the design process progresses. 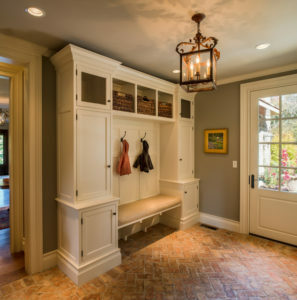 Take note of any areas of your home that fall under the category of “wasted space.” Since mudrooms are so flexible, they can be adapted to fit in less-than-ideal areas. An odd corner may be all you need. While some of us are lucky enough to have a designated area for a mudroom, this is not always the case. Luckily, these spaces can become the epitome of multifunctional usage. If needed, standalone storage options can turn just about any area of your home into a makeshift transitional space. While the entryway of your most-used door is likely the best location, consider whether you have any specific goals in mind that might make another area more ideal. Since the purpose of the space is to allow you and your family to easily transition from an outdoor to an indoor environment, make sure you have all the storage pieces in place for this process to go smoothly. Maybe it takes your kids forever to put their shoes on and they’d benefit from a dedicated shoe bench right beside the door or maybe you have a bad habit of losing your keys and should include a small bowl in which to keep them. Once you have your wish list in mind, turn your attention to how you should lay out the space. Your mudroom will be a part of your home and it deserves just as much attention put into its interior design. The best way to pull together spaces like this is through a coherent color scheme. Bright, patterned wallpaper adds an element of fun, color, and personality to any mudroom. Put wallpaper on every wall, one wall, or even the ceiling for that extra touch…Once your colors are in place, don’t hesitate to add in a few accent pieces to give the space a decorative flair. Use throw pillows or wall art to help finish off the look nicely. Even if you’re working with a limited area, a few small touches can make a big difference. We hope you will use our mudroom tips as a guide to taking this mudroom concept and making it your own. Whether you are concerned about the inclement weather or just want to help your family get out the door easier, storing all of your gear in one area will make a difference.